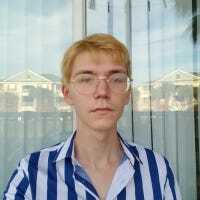 Bluetooth connections only have a limited range of about 30 feet, and they can usually only connect to a single Bluetooth device. But RF signals are much stronger. The best RF headphone transmitters have a signal range of 328 feet, and they can broadcast to an unlimited number of devices. That makes RF headphones perfect for whole-home listening parties, or for quietly watching a movie from across the room. A set of RF headphones always comes with an RF transmitter. These transmitters take the audio signal from your TV or stereo and turn them into radio waves, like a miniature radio tower in your living room. In fact, if you need any convincing to go with an RF headset over a Bluetooth model, that’s probably it: there’s no pairing, repairing, or lost connections once you do the initial setup. Like a radio tuned to a specific station, the headphones will never lose their connection. It’s all the wireless freedom of Bluetooth but none of the annoyances. These transmitters are also used to dock and charge your RF headphones, which are powered by batteries, not cables. That’s seems simple enough, but it can be hard to find yourself the perfect set of RF headphones. Some of them are pretty straightforward, while others are chocked full of knobs and EQ options. That’s why we’ve taken the time to find the best RF headphones for everybody’s needs. It’s hard to find a good set of RF headphones without breaking the bank. 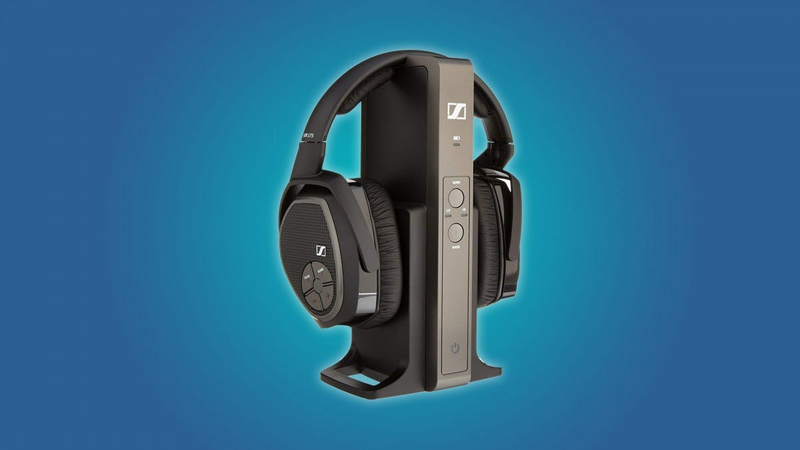 If you’re looking for an affordable set of RF headphones that comes with some premium features, then you should take a look at the Sennheiser RS 120. The RS 120 transmitter can hold a connection of 120 feet, and it connects to your TV via RCA, 1/4″ or AUX cable. The RS 120 headphones are light and ergonomic, and they have volume controls, so you don’t have to get up to adjust your sound. They may not have any EQ or noise-cancellation settings, but for $74, they’re a great way to listen to music or TV from anywhere in your home. They’re among the best rated RF headphones on Amazon—four stars over a staggering 15,000+ ratings—for a good reason, after over a decade the design is still going strong. Some people don’t want their RF headphones to have a lot of complicated options or settings. The ARTISTE RF headphones are affordable, comfortable, and simple. The receiver has a 100-foot range, and it connects to your sound source via AUX cable. The ARTISTE RF headphones have a 20-hour battery life, and they designed to offer a crisp, comfortable listening experience. They don’t have buttons to adjust EQ or volume, but that shouldn’t be a big deal if you’re just watching TV. A lot of these headphones offer a range of about 300 feet, but a 100-foot range isn’t necessarily a bad thing. Since RF headphones operate on a radio frequency, it isn’t difficult for snoops to tune into whatever you decide to broadcast. A 100-foot range should be enough to cover your whole home, without letting the world know that you’re binge-watching ASMR videos on Youtube. 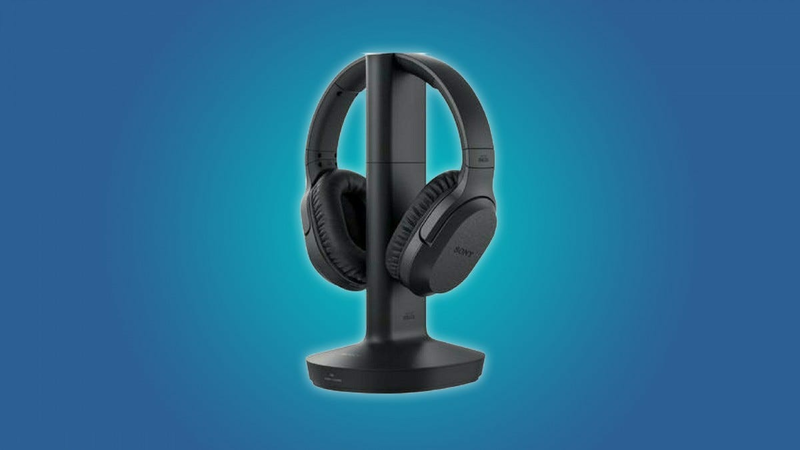 If you’re looking for a mid-range RF headphone set, then you should check out the Sony RF995RK. 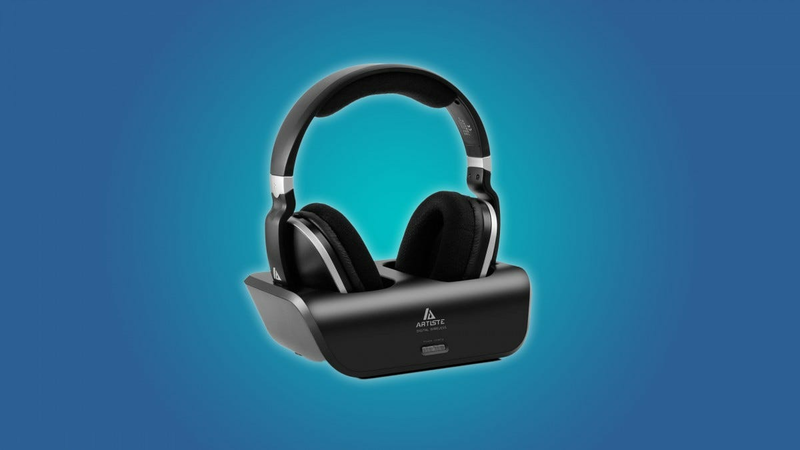 It has some unique features that are usually reserved for more expensive devices, while still maintaining the simplicity and affordability of cheaper RF headphones. The Sony RF995RK’s transmitter can broadcast a signal of 150 feet, and it connects to your audio source via RCA cables. It doesn’t have any EQ options, but it looks good and it does its job with gusto. Like several of our other RF headphone choices, the Sony RF995RK has a 20-hour battery life but it has a bonus feature: noise reduction technology, so you can forget about the outside world and focus on your movies or music. It has crisp audio that’s specifically designed for the home cinema, and a deep bass sound that music lovers can appreciate. There aren’t any volume settings on these headphones, but you can always control the sound from your TV with a remote control. There are a few rules in the world of home audio. The most common rule is that premium features come at a premium price. The Sennheiser RS 175 RF headphones are an example of this rule. This is an expensive RF headphone set, but it’s worth the money. The RS 175 transmitter looks fantastic, and it has a range of 328 feet. 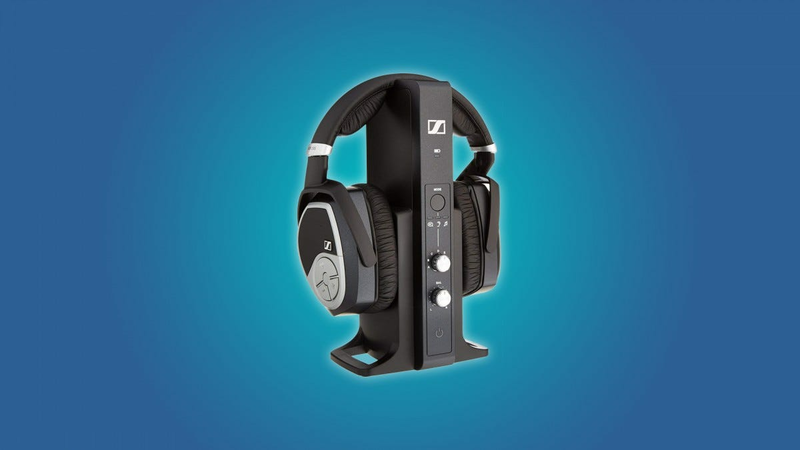 It connects to your audio source via optical or AUX cables, and it features two EQ buttons for bass boost and surround sound. But what about the headphones? They sound great, they’re ergonomic, and they have a 20-hour battery life. There are volume and EQ controls on the side of the headphones, so you don’t have to get up to adjust your sound settings. Plus, the RS 175 headphones have a closed-back design that helps to eliminate background noise, so you can cocoon yourself in rich sound. If you’re looking for a super-premium pair of RF headphones, then you should take a look at the Senheiser RS 195 RF headphones. The RS 195 transmitter has a range of 328 feet, with a handful of EQ settings and panning options. It can connect to your TV via optical, RCA, and Aux cables. But as you can imagine, the headphones themselves are the real star of the show. 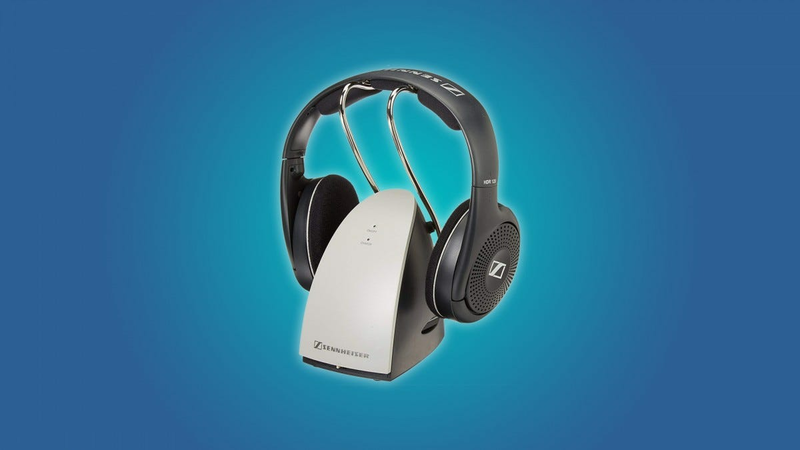 The Sennheiser RS 195 headphones have a high dynamic range, so you can understand quiet scenes and enjoy deep, booming sound. 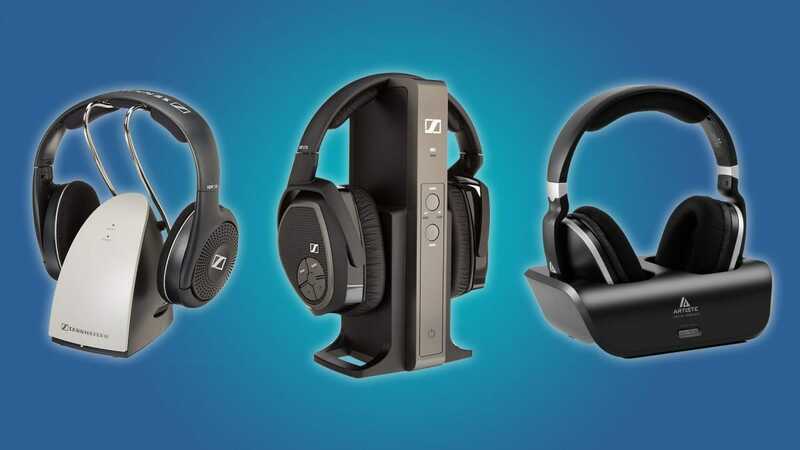 They’re ergonomic, they have a 20-hour battery life, and they have noise cancellation technology, so you’ll be comfortable caught in the world of wireless audio. There are also volume settings on the headphones, and a remote EQ button, so you don’t have to get up to change the quality of your sound. This is a great option for people that are very serious about their home cinema or music listening experience. It’s a bit expensive, but it’s worth the price if you want to get the most out of your wireless listening experience. When making plans for the next few days or week, it’s useful to know the weather forecast—even if just to know when to bundle up or bring an umbrella. We’ve rounded up some of our favorite weather apps for keeping an eye the skies (without even peeking outside).